Debbie M. Lakes of Morristown, Tenn. was born August 28, 1966 and departed this life Wednesday December 26m 2018 in Knoxville, Tenn., being 52 years of age. She was the daughter of Johnny and Agnes Locke of Morristown, Tenn..
Other than her parents Debbie is survived by her husband of 31 years Craig Lakes and one son Carson Lakes, her father and mother in law Carl and Carolyn Lakes and one brother Johnny Ray (Diane) Locke all of Morristown, Tenn.. She is also survived by several very special cousins and grand dog Nubby and a woman’s best friend- her dog Angel. Debbie was a member of the Friendly View Missionary Baptist Church. 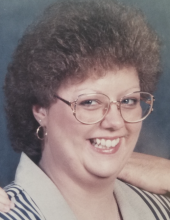 Funeral services for Debbie M. Lakes were held Saturday December 8, 2018 at 3:00 P,M. at the Stubblefield Funeral Home in Morristown, Tenn.
A committal service was held at 1:00 P.M. on Sunday December 9, 2018 at the Lakes Funeral Home . Burial in the T.M. Lakes Cemetery at Sand Gap, Ky.
"Email Address" would like to share the life celebration of Debbie (Locke) Lakes. Click on the "link" to go to share a favorite memory or leave a condolence message for the family.